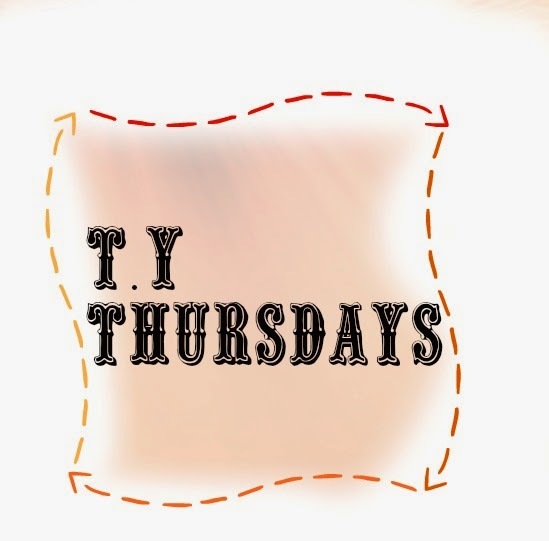 Dainty Sprinkles: TY Thursdays #1 : Induction, Bin Bags and Paper Napkin Fashion Show ! 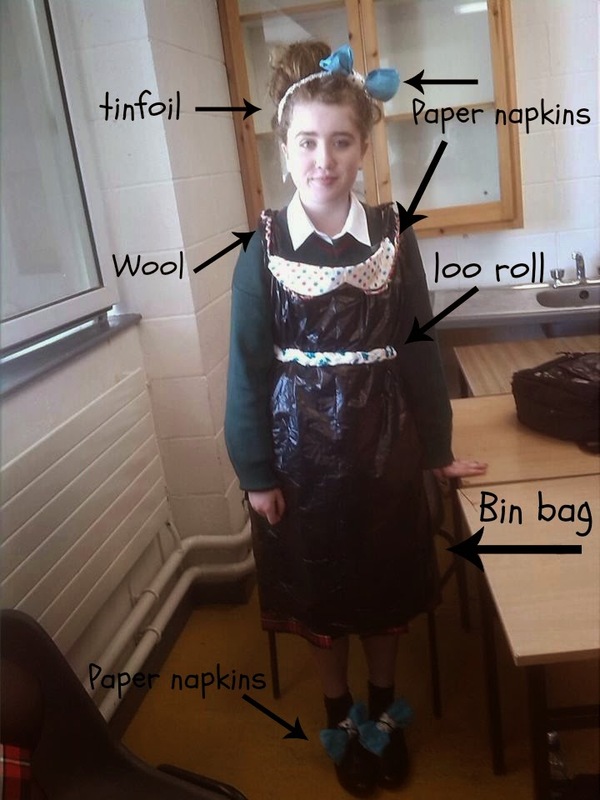 TY Thursdays #1 : Induction, Bin Bags and Paper Napkin Fashion Show ! Transition Year began on Monday and for a first week, it's been pretty fun and interesting so far ! We had induction for the first two days which seemed to drag on forever, only because my friends and I's thoughts were preoccupied by worrying about what class tutor we were in and if we got all the subjects we'd applied for. We were told of what transition year consisted of, information on work experience and the portfolios we'll be doing (i.e this !) plus what modules were available - most of these things we already knew about, but it was still good to 'refresh' our memory of what we'd learned about TY before now ! I resembled a bowl of jelly when the class tutor lists were being called out but I was slightly comforted by the wise words of Chyan and Liana "there's twelve of us, there's six class tutors, lets keep thinking that way". In the end, I got into a brilliant class tutor which I love and there's also three of my friends in there too so things didn't work out half as bad as I thought they would ! My favourite day this week was Tuesday when we put on the 'fashion show' ! I feel like I really 'came out of my shell' this day and went home feeling so happy, I felt like I could burst. I had repeatedly said to my friends that I had no bother with the fashion show as long as I wasn't the 'model' for the group I was in so you can guess who ended making an eejit out of their self for my group (Moi. Yes, me.). The exercise, as you might call it, happens every single year so we all kind of knew what was coming at of us before we even walked in on Monday and the purpose is generally team bonding and getting to know your new classmates. Although I was in a group with my friends Bronwyn, Emma and Leah who I obviously knew very well already, none of my friends or even friends of my friends were 'modelling'. So not only did I have to walk down the oratory in front of all one hundred and fifty of my year plus teachers, I couldn't exactly stand there waiting for the daunting event to start on my own so I forced myself to chat with people I didn't know too well and even some who I'd never met before which is something I can never bring myself to do. Good thing was, we all knew we were about to make right fools out of ourselves ! It was hilarious watching everyone walk up and down the oratory especially the ones who did mockery struts and poses. Everyone had their phones and cameras out (I didn't manage to get any photos of the models in their outfits unfortunately.) so I'm pretty sure I just sped walked up and down to get it over and done with as soon as I could ! Congratulations to the group who's wedding theme won the fashion show, there were three of them in the group - one dressed as a bride, one as a groom and one as a priest (or bishop I think he became !) , it was definitely well deserved ! As for the outfit we made, I don't even know what it was even inspired by (we didn't even have a theme !) but the four of us agreed that we wanted to do a particular style of dress which I would compare to a pinafore. We were also dead set on either a collar or dickie-bow at the top of the dress and as you can see, a peter pan collar was cut out of a polka dot napkin in the end and we lined it with plaited sparkly wool ! There was also a need for some kind of belt around the waist in order to give the dress a shape so loo roll was plaited (again, if in doubt, plait !) and there was blue highlighter running through it to fit in with our colour scheme and there was plaited wool again on the straps of the dress ! My favourite part of the outfit are the bows. I was in awe of the bow hairband, it was so cute and so real (as in not tinfoil and napkins.) I wanted to wear it forever ! 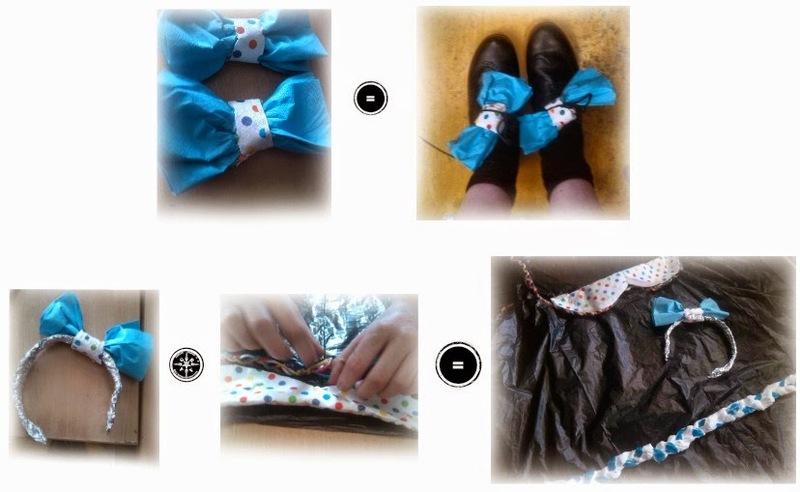 Creating some kind of footwear was also suggested so we made bows again out of napkins and tied it in my laces. It honestly made such a difference to the outfit and was probably the finishing touches we needed so then after that, we decided to leave the outfit as it was there and then and not to go overboard and in the end it received lots of compliments ! Since then we've began classes and the optional subjects I chose are Japanese, art, history, French and music. Today we had double maths and considering it was my first time having a double in the subject, I was so surprised that it was probably the first time in forever that I managed to concentrate and stay interested in the subject for an entire class let alone a double which was brilliant since I do really like maths, the problem is that I am dreadful at it. Maths and I, we're in an ongoing love-hate relationship but it's helping that I've got a good teacher ! Music has also been much more fun so far than I expected and a lot of that is because it's not as theory based as it was in the Junior Cert - it's more based around projects and practical elements. It's hard to believe the week's almost over ! This time next week, I'll have got back my Junior Cert results and everyone I know seems to be petrified yet I just can't wait to see how bad I did in Maths and Science. That probably wasn't the best thing to say. Oh my gosh, what a creative idea. I cannot get over how cute that headband is....can't believe it's made of tin foil!